A hitwoman who works for a crime family takes in the son of one of the targets she assassinated. Now, she wants to leave the business, but her boss won't let her go without a fight. January is a notorious dumping group for bottom-of-the-barrel movies. Every so often, a good one sneaks through the early-year cesspool, but more often than not, January is overloaded with the cream of the crop of frighteningly bad flicks. When a movie doesn't get a lot of promotion from a studio (regardless of its release date), it's usually because it belongs in a month like January. "Proud Mary" surprisingly got no love from Sony. It was barely marketed. We can only remember seeing one trailer for it in 2017 and we never even saw a poster for it being advertised in the lobbies of the theaters we frequent. It seemed like Sony didn't have much faith in the project. Despite that, we hoped it would be good since we are fans of both Taraji P. Henson and big action movies. So, is this movie any good? We will get to that in just a bit. "Proud Mary" is directed by Babak Najafi, who is known for directing "London Has Fallen," because if you want to make a killer action movie with a strong Black female lead, the director of the critically panned "London Has Fallen" seems like a good place to start, right? It stars the aforementioned Taraji P. Henson as the titular Mary, a badass assassin working for a Boston crime family. After her most recent hit, Mary notices her target had a young son, played by Jahi Di'Allo Winston, whom she leaves alive since he was too busy playing video games to notice his dad got shot in the head. A year later, the boy is now delivering drugs for a mob under-boss named Uncle, played by Xander Berkley, who regularly beats him and doesn't appear to feed him regularly despite saying that he does. Once again, Mary runs into the kid, and feeling a little guilty, she wants to free him from his tormentor. She takes steps to make that happen and takes her former target's son into her home. Her action may start a crime war, but she wants to leave the crime business anyway. Unfortunately, her boss Benny, played by Danny Glover, won't let her go that easily. If the description of "Proud Mary" sounds a bit disjointed, that's because the movie itself is massively disorganized. The narrative makes almost no sense. There is no real sense of cause and effect. Things happen regularly that have little bearing on the overall story. The series of events goes from A to B, then from B to H to Q, then to F and back to B, and then finally we end at Z. It's truly all over the place. The entire plot about a crime war brewing between two mob families seems like it only exists to fill the very short 88-minute runtime with moments of try-hard tension, all of which ultimately fail to deliver any thrills. More important but not quite clear is why Mary goes from killer to mother just like 'The Bride' in "Kill Bill." The main plot is about Mary wanting to leave her criminal past behind and even that seems to come out of nowhere. It feels like giant chunks of the story got left on the cutting room floor, pieces that would have filled in the gaps to make a more cohesive screenplay. The movie is also far more melodramatic than we expected. The trailer promised audiences a character along the lines of Foxy Brown meets John Wick, but this promise is quickly broken. Apparently, women can't just be kickass assassins, they have to be nurturing, too. The action comes here and there, but even those scenes feel underwhelming. On the other hand, the final big action sequence is so over the top and unbelievable in an otherwise mostly serious movie that it was hard to fight off our laughter with how ridiculous it was. It felt like we went from watching a Michael Mann movie to a Michael Bay movie completely out of nowhere and for no reason. So, is this movie good? No, no it is not. Here's the real question: did the studio have no faith in "Proud Mary" because it was bad, or is it bad because the studio never had any faith in it in the first place? We will never know. All we know is Taraji P. Henson deserves a better vehicle than this awful film to showcase her tremendous talents. She tries her best to elevate the mess that's made here, but even someone with her skills can't make something out of nothing. 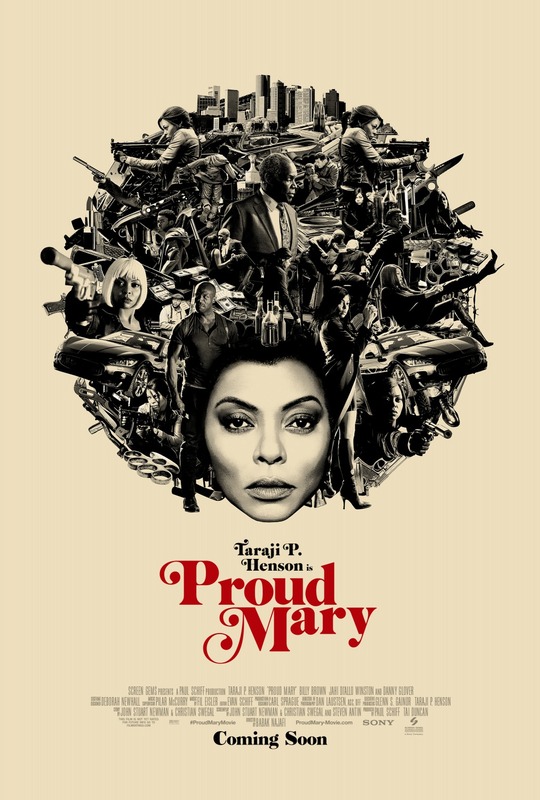 There are only a handful of genuinely decent moments in this movie, and even those aren't enough to make "Proud Mary" worth renting let alone seeing in a theater. We've seen tons of movies with hit men and hit women, but a black hit woman not so much. It was an action pack and not many surprises, however, the fight scenes were executed well and Mary was a badass with a heart. Hi Arthur! That is very true! We just wish movies didn't feel the need to make all women have a maternal instinct. They can't ever just be badasses, you know? There always has to be something else driving them instead of innate badassery. We are glad you liked this one! Hopefully Taraji P. Henson keeps getting leading opportunities like this because we really enjoy her as an actress!